Being a customer-centric company is a complex task. It requires a perfect understanding of consumer behavior. 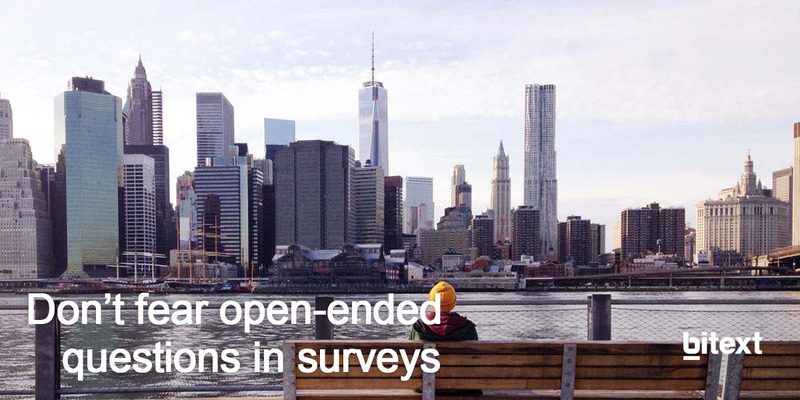 To achieve this goal companies are using open-ended survey questions, reviews and opinions. The main objective is to maximize business value from customer’s feedback. This week and in the upcoming ones we will show you through case studies and tutorials the importance of automating coding and how to create a coding plan. So all your customer’s answers and reviews can be easily analyzed. The case we are going to use as an example involves a global automotive leader. They wanted to gain an understanding of what drives customers to recommend their brand. To achieve their objective, they decided to map their customer journey in all the possible interactions. Following the customer from the point of sale, during the first days of usage, periodical maintenance etc. All the situations were quite different between them even if the final objective was the same: getting to know the customer’s behavior, attitudes and beliefs. For a better understanding of the customer in those situations open-ended questions emerged as the best resource to use in the research. They fuel your research activities with rich insights into the “why” behind your audiences’ responses. Numeric scales are not always enough. But the problem then is the multilingual approach, if you are a global company you need to conduct the research in a wide range of countries with the consequence of having to employ a vast amount of resources. This resources that are at the same time expensive and time consuming: different people that do not interact working in very different regions and have to meet the same deadlines. Also new challenges arise. As to be able to ensure accuracy and consistency among the different languages. At the end it all comes to being able to employ text analysis to free resources, reduce costs and use all the available data. If you want to know more details about the automatic coding process and the benefits it can provide to your business download our case study!